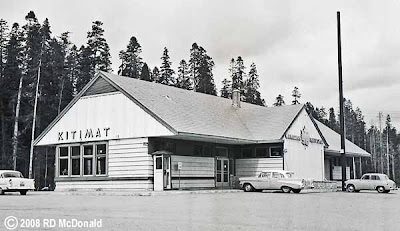 Canadian National Railways, Smithers Division, Kitimat Subdivision, Mile Post 38.5, May 9th, 1959. When Canadian National Railways opened its line from Terrace to Kitimat, B.C., on January 13, 1955, the "Last Spike" ceremony featured a spike made from aluminum produced at Alcan Smelters and Chemicals, Ltd., massive new Kitimat plant. The plant was constructed on the Northern BC coast because of water - hydro for cheap electricity. Bauxite was brought in by bulk carriers from Australia and Jamaica. And ingots were shipped out around the world. In the 1950’s, Alcan undertook the Kitimat/Kemano project, arguably one of the most ambitious engineering projects of the 20th century. It included construction of a massive dam which redirected of several rivers, a 10 mile tunnel to carry water from the dam to a massive underground power house, long transmission lines over a mile high pass to a giant new aluminum smelter and a new company town - which included housing for plant employees, a hospital, and shopping centre. The main company construction town for the 10 mile tunnel, underground power house, and transmission lines to Kitimat was named Kemano, some miles south of Kitimat. Kemano settlement was originally built in the 1950s, home to a thriving small community, featuring a guesthouse, one shop which sold everything from candy to guns to socks to hats, a golf course and a church. It eventually closed its doors as a community in 2000, the residents were moved out, and the majority of houses (including the school) were burnt down as a training exercise for selected fire departments from all of BC. The plant still exists and is operational. 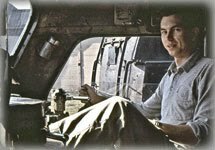 My train chasing buddy Mike and the brand new company town of Kitimat in April 1959, with a lot of construction still taking place. My family took the tour of the smelter at Kitimat in 1958. The pot lines were (and are) almost a quarter mile long. At the beginning of the tour, the guide instructs us all to remove watches and cameras, which are held for safe keeping. As we advance amongst the electric furnaces melting the bauxite to extract the aluminum, the Guide threw a 5 foot piece of steel reinforcing bar onto the concrete. It clangs to the floor, and then, like a skinny cobra, one end of it lifts off the floor, and the bar weaves back and forth in the magnetic currents of of the electric furnaces! That field would magnetize a camera's steel shutters, and ruin a watch mechanism! As as a special treat , we caught Canadian National Railways 5000, a 4-6-2 Pacific, with Mixed Train 892 at the Kitimat Station, a Type 100-356 plan, completed in 1956. Probably one of the last photos ever taken of the CNR 50-hundred, as her days were dangerously numbered! 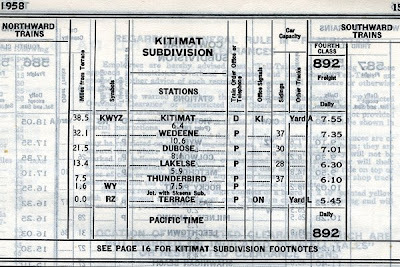 I never had the opportunity to cab ride the Kitimat Subdivision between Terrace and Kitimat, but I aways knew we'd beat the train! The 38.5 mile Kitimat subdivision was restricted to 25 mph! Shown here Fourth Class 892 Mixed Train, with GMD 1750hp GP-9 CNR 4208. She and many of her sisters were built on Flexicoil trucks, with stripped down under frames – notice smaller fuel tank – to lighten them for branch line work. And the ubiquitous "Spark Sentry" spark arrestor. I love the ambiance of a mixed train, where things just sorta come together in a practical sorta way!